Earth Rot are an Australian blackened death metal band and this is their second album. As Earth Rot’s last EP Chthonian Virtues was one of my favourite releases from 2016, I was very excited to hear Renascentia. 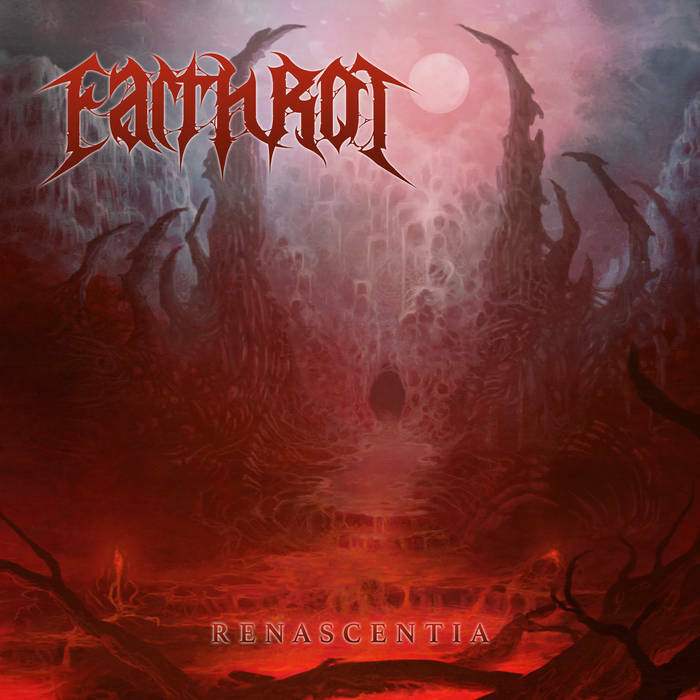 If you haven’t encountered Earth Rot before, they play viscous, ugly death metal with a black metal influence that can be heard tearing up alongside it. The band’s filthy death metal mainly takes influences from older times, although some newer ones can be heard in their music too. Think of bands like Entombed and Grave from the old-school Swedish scene, mixed with some second wave black metal melodies and just the barest hint of a more modern groovy approach. I’d say that on this album the band have developed their black metal side further than on the EP. They’ve accomplised this without sacrificing their raw death metal core though, which is great to hear. They’ve got the balance of ingredients right on these tracks, so that brutality and melody are used to create songs that compel you to return to them again and again. Combining black metal with Swedish death metal is not commonly done. Gutter Instinct are the most obvious other band that spring to mind that have recently done this to great effect, although it should be noted that Earth Rot are a different proposition to them; Renascentia is far more feral and goes straight for the jugular every time. These brutal songs try to skin you alive with their abrasive buzzsaw guitars and savage vocals. One of the great things about Earth Rot is that they provide so much dirty aggression for the listener to revel in, while also somehow finding the time to produce songs that are both catchy and memorable. They can also stir up a good macabre atmosphere when they want to. I love Swedish death metal at the best of times, so it’s great to see bands cutting it with other influences too. Whether this is Earth Rot’s engaging barbarity, Morfin‘s forward-thinking nature, or Henry Kane‘s deathgrind madness, there’s so many good bands taking the base style and working with it in their own way at the moment. Top stuff. After the wonder that was Chthonian Virtues I was hoping for good things form Earth Rot. I have not been disappointed; Renascentia raises the bar even higher. This entry was posted in Death Metal and tagged Black metal, Blackened Death Metal, Death Metal, Earth Rot, Entombed, Grave, Metal, Old-School Death Metal. Bookmark the permalink.